The ONE polymerase for your endpoint PCR needs. OneTaq DNA Polymerase is an optimized blend of Taq and Deep Vent® DNA polymerases for use with routine and difficult PCR experiments. The 3´→ 5´ exonuclease activity of Deep Vent DNA Polymerase increases the fidelity and robust amplification of Taq DNA Polymerase (1) . The OneTaq Reaction Buffers and High GC Enhancer have been formulated for robust yields with minimal optimization, regardless of a template’s GC content. 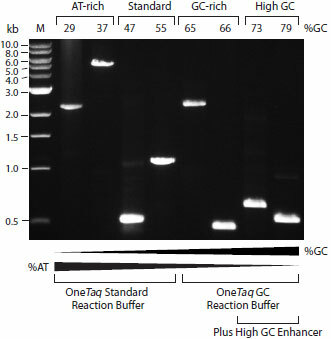 OneTaq DNA Polymerase is supplied with two 5X buffers: (Standard and GC), as well as a High GC Enhancer solution. For most routine and/or AT-rich amplicons (Lambda, etc.) 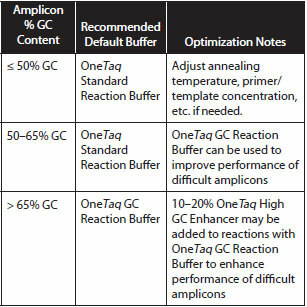 or complex amplicons with up to ~65% GC content, OneTaq Standard Reaction Buffer provides robust amplification. For GC-rich amplicons, the OneTaq GC Reaction Buffer can improve both performance and yield. For particularly high GC or difficult amplicons, the OneTaq High GC Enhancer can be added at a final concentration of 10–20% to reactions containing OneTaq GC Reaction Buffer. Amplification of a selection of sequences with varying GC content from human and C. elegans genomic DNA using OneTaq DNA Polymerase. GC content is indicated above gel. Marker M is the 1 kb DNA Ladder (NEB #N3232). The OneTaq High GC Enhancer should not be used alone. It should be added only to reactions with the OneTaq GC Reaction Buffer and will typically improve yields when other conditions have failed. Product specifications for individual components in the OneTaq DNA Polymerase mix are available separately. Which buffer should I use? Which buffer should I use if I want to control the level of magnesium in the reaction? How should I set up an amplification reaction using OneTaq® DNA Polymerase? Did you know most OneTaq reactions amplify more efficiently and robustly when you use a 68°C extension temperature? Purchase of this product provides the purchaser with a non-exclusive license to use OneTaq® DNA Polymerase for research purposes only. NEW ENGLAND BIOLABS®, ONETAQ® and THERMOPOL® are registered trademarks of New England Biolabs, Inc.